[DISCLAIMER] EMAS SYSTEM IS ONLY FOR EDUCATIONAL AND RESEARCH PURPOSE ONLY. ALL THE LISTED CONDITIONS ARE ONLY FOR REFERENCE AND NOT USED AS DIAGNOSING YOUR CONDITION. PLEASE CONSULT WITH YOUR DOCTOR FOR DIAGNOSIS AND FURTHER EXPLANATION OF YOUR CHART. 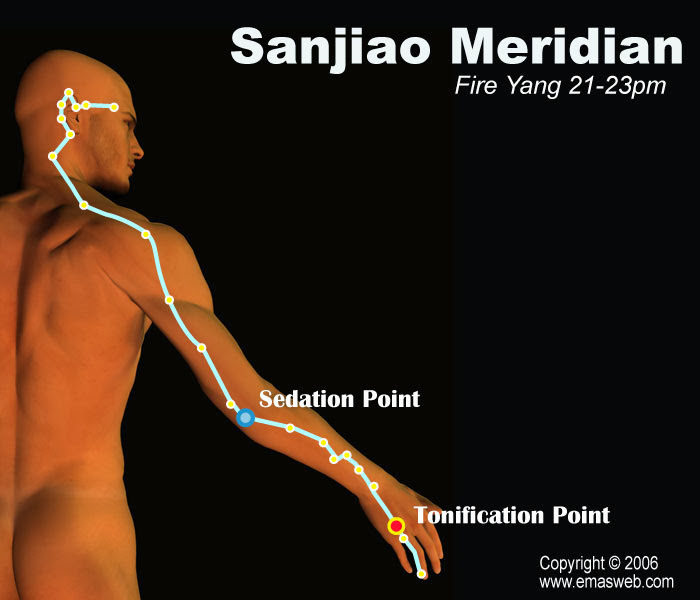 The Sanjiao Meridian connects with the Pericardium Meridian, with which it is externally-internally related. Symptoms of the Sanjiao Meridian include abdominal distention, edema, enuresis, difficult urination, deafness, tinnitus, etc. In addition, abnormalities of Sanjiao Meridian circulation also result in sore throat, and pain of the eyes, cheeks, shoulders, elbows, the region behind the ears, etc. The Sanjiao is not a single organ. In fact, it is an important pathway to transmit qi, blood, and water through the body. If the Sanjiao Meridian is unblocked, the body will be healthy. If Sanjiao Meridian is blocked, the body will suffer from all kinds of diseases. On the other hand, since the Sanjiao exists all over the body, abnormalities of the Sanjiao often reflect abnormalities of other organs, such as inflammation and infection. So when we discover an abnormality of the Sanjiao Meridian, we should find out whether any sort of abnormality exists in the other meridians. And if the overall body energy is low, we should determine if it is caused by an abnormality of Sanjiao Meridian or by other factors. Peak qi and blood flow in the Sanjiao Meridian is from 9:00 pm to 11:00 pm. 1.Diseases of the chest, heart, lungs, and throat. 3.Diseases along the course of the Sanjiao Meridian. Related regions: lymphatic vessels, ears, eyes, neck, chest, and abdomen.